The Full Report is out! 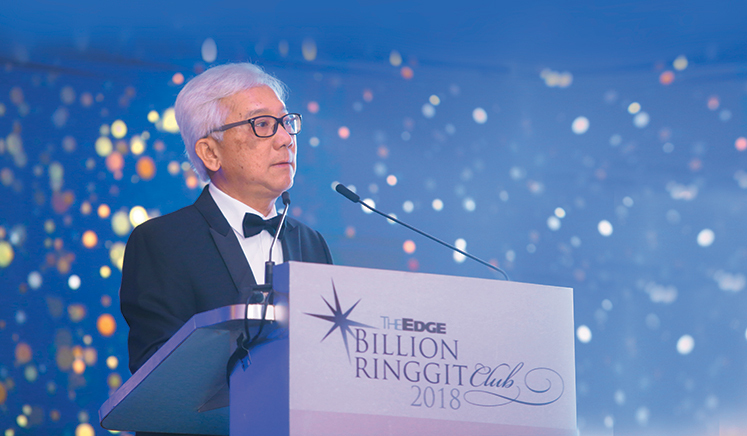 The Edge Billion Ringgit Club’s annual gala dinner held on Dec 11 saw 40 companies picking up 55 awards for being the best performers on Bursa Malaysia based on their financial performances from FY2014 to FY2017. This year, based on the March 31 cut-off date, there were 170 companies listed on Bursa with a market capitalisation of RM1 billion or more. Although there were 184 listed companies last year, the total market cap of this year’s 170 came in higher at RM1.69 trillion versus RM1.59 trillion, and constituted 90.8% of Bursa’s total market cap as at March 31. The combined revenue of the 2018 BRC members was RM806.7 billion in FY2017, up from RM747.1 billion in FY2016 while their collective pre-tax profit was RM123.19 billion, up from RM108.6 billion. Although the number of billion-ringgit companies on Bursa fell to 170 this year, their performance in terms of profitability and market capitalisation was better as a whole than the 184 that made it to the list in 2017. This means that BRC members are truly the strongest of Corporate Malaysia. Of the eight chosen as Company of the Year since our inaugural awards in 2010, seven have since outperformed the FBM KLCI in terms of total returns to shareholders. Returns to shareholders over three years — a combination of dividend payout and share price performance. For Company of the Year, we used a matrix of financial performance in the three categories and corporate responsibility initiatives on a weighted basis. This year’s Company of the Year was Petronas Dagangan Bhd, which operates 1,000 petrol stations with over 700 Kedai Mesra in the country, which have become one-stop centres for motorists for fuelling, shopping and banking. The company also achieved strong recurring pre-tax profits averaging RM1.2 billion a year between 2015 and 2017 while its market capitalisation more than doubled from RM11.6 billion in 2010 to RM25 billion in 2017. Petronas Dagangan has also been generous to shareholders with dividend payouts of 60 sen per share in 2015, 70 sen in 2016 and a hefty 97 sen or almost RM1.0 billion in 2017. This year’s Value Creator: Malaysia’s Outstanding CEO award went to Dialog Group Bhd executive chairman Tan Sri Dr Ngau Boon Keat. As a young Malaysian engineer in Singapore, Ngau decided to balik kampung in 1975 to join the then newly set up national oil company Petronas. He was part of the team that came up with the production-sharing contract that Petronas uses till today. In 1984, Ngau started Saga Holdings with three partners and in 1996, listed it on Bursa as Dialog Group Bhd. Today, the company is one of the biggest integrated oil and gas service providers in the region. It is a pioneer investor in Pengerang, Johor, where it owns and operates petrochemical, oil and LNG storage terminals and a deep-sea port. Dialog’s market capitalisation stands at around RM18 billion today, up fivefold from RM3.6 billion in 2010. The success of BRC as benchmark awards for Corporate Malaysia would not be possible without the support of our partners. I would like to thank OCBC Bank, Jaeger-LeCoultre and Mercedes-Benz for partnering The Edge in this prestigious event to honour and celebrate the best of Corporate Malaysia. This has been an unprecedented year for Malaysia. The historic change in government has had some immediate consequences for businesses, better for some and not so good for others. A clear economic strategy to take the country forward is still in the making. This uncertainty, together with the volatile global environment, presents many challenges to Corporate Malaysia. But as the saying goes, when the going gets tough, the tough get going, as BRC members have consistently proved. Congratulations to all the winners of the 2018 BRC awards. At 170, the number of The Edge Billion Ringgit Club (BRC) members — companies listed on Bursa Malaysia with a market cap of RM1 billion or more — is the lowest we’ve seen in three years. That’s based on the end-March membership cut-off date. Had the cut-off date been pushed to end-November, there would have been only 157 members, a five-year low. Even so, this year’s 170 BRC members’ combined market capitalisation of RM1.69 trillion was higher than the collective market value of RM1.59 trillion of last year’s 184 members. The RM1.69 trillion constituted 90.8% of the total market cap of Bursa Malaysia as at end-March — a testament to the significance of this elite group of companies. The combined revenue of the BRC 2018 members was RM806.7 billion in FY2017, up 8.4% from RM744.1 billion in FY2016. This year’s BRC members also made a collective pre-tax profit of RM123.19 billion in FY2017, up 13.4% from RM108.6 billion in FY2016. Collective net profit was RM90.7 billion in FY2017, up 13.4% from RM80 billion in FY2016 which was weighed down by sizeable losses at several oil and gas companies. BRC members continue to be major taxpayers, paying an estimated RM32.5 billion in taxes for FY2017. Not only is this an increase of 13.5% compared with the RM28.6 billion in taxes estimated for FY2016, the estimated taxes paid for FY2017 is about half the RM64.47 billion in company income tax collection estimated by the government for 2017. The federal government also estimated company income tax at RM70.536 billion for 2018 and RM70.187 billion for 2019. The taxes paid by BRC members for FY2017 is also estimated to make up about 26.3% of the RM123.33 billion in direct taxes the Inland Revenue Board reportedly collected in 2017 and 28% of the RM116.02 billion in direct taxes the government estimated for 2017. In February, the taxman reportedly aimed to collect RM134.713 billion in direct taxes in 2018. This is comparable to the RM133.5 billion of direct taxes the government estimated for 2018. To be sure, the end-March cut-off date is not ideal. Not only did the FBM KLCI decline 9.2% from 1.863.46 points as at end-March to 1,691.5 points as at end-June before rising 6% to 1,793.15 points by end-September, Malaysia also experienced its first change of ruling coalition in May since independence 61 years ago. Then there’s the unexpected escalation in the US-China tariff war and the faster-than-expected pace of the US Federal Reserve’s interest rates normalisation despite the many tweets from US President Donald Trump. At the time of writing, the bellwether index was hovering near the 1,679.86 points it was at as at end-November. We did consider recalibrating our share price data — used to determine winners for the highest returns to shareholders over three years portion of the BRC corporate awards — due to the late timing of the BRC gala dinner this year. We decided, however, to retain the June 30 cut-off to compute the total returns to be in line with the financial data for FY2014 to FY2017 used to calibrate winners in the categories for highest weighted return on equity (ROE) over three years and highest compound annual growth rate (CAGR) in profit after tax over three years. The earlier end-March cut-off date for membership is to allow time for BRC judges for the corporate responsibility (CR) component, which makes up 30% of the marks for The Company of The Year award. Carlsberg Brewery Malaysia Bhd has been in the BRC top 20 in all eight of the annual rankings since 2011, with the exception being 2010, the year the BRC awards began. Dialog Group Bhd and Public Bank Bhd made it six out of nine times to the BRC Top 20, while Dutch Lady Milk Industries (M) Bhd, Guinness Anchor Bhd and Hap Seng Consolidated Bhd have made it five out of nine times. It is also worth noting that of the eight companies chosen as The Edge BRC Company of The Year since our inaugural awards in 2010, seven continue to outperform the FBM KLCI in terms of total shareholder returns since winning the distinction. We will present more data on this next year in the 10th edition of The Edge BRC corporate awards and gala dinner. With their outperformance came sizeable gains in their respective market capitalisation. Including this year’s winner, Petronas Dagangan Bhd, seven out of the 10 companies named Company of the Year have seen triple-digit growth in market valuation between end-2010 and end-2017, with the most impressive being Dialog (298% or a RM10.6 billion gain in market cap), Dutch Lady (M) Bhd (253% or a RM2.8 billion gain), QL Resources Bhd (206% or a RM4.75 billion gain). There were also sizeable gains in market value over the seven-year period from Tenaga Nasional Bhd (137% or a RM50 billion gain), Digi.Com (107% or a RM20.5 billion gain), Petronas Dagangan Bhd (107% or RM12.5 billion gain) and AirAsia Group Bhd (60% or a RM4.2 billion gain). Supermax Group Bhd would have also been able to show a doubling of its market cap if its end-2010 value was measured against its market cap currently, or end-2016 instead of end-2017. Genting Bhd’s market cap, however, has slipped significantly since end-2010. For the Company of the Year, we used a matrix of financial performance in the three categories and corporate responsibility initiatives on a weighted basis: three-year ROE (20%), three-year shareholder return (20%), three-year profit after tax growth (30%) and corporate responsibility (30%). For this year, due to our end-March 2018 cut-off date for BRC membership, OldTown Bhd, which delisted in April, is still listed as a member. Meanwhile, Mi Equipment Holdings Bhd, which debuted on the Main Board on June 20 this year and had just over RM1 billion market cap at the time of writing, is not on the list. If the BRC membership cut-off date had been end-November, there would have been 157 members as eight companies would be added, 20 companies would be excluded for slipping below the RM1 billion market cap, and one delisted. The additions would have been Taliworks Corp Bhd, Guan Chong Bhd, GHL Systems Bhd, Mi Equipment, SAM Engineering & Equipment Bhd, TA Enterprise Bhd, Ranhill Holdings Bhd and MyNews Holdings Bhd. Companies with a market value below RM1 billion as at end-November were Bumi Armada Bhd, George Kent (M) Bhd, Ekovest Bhd, Kretam Holdings Bhd, WCT Holdings Bhd, AirAsia X Bhd, Ann Joo Resources Bhd, Berjaya Land Bhd, Hai-O Enterprise Bhd, Ta Ann Holdings Bhd, Econpile Holdings Bhd, MCT Bhd, Kian Joo Can Factory Bhd, Pestech International Bhd, Malaysia Marine and Heavy Engineering Holdings Bhd, Datasonic Group Bhd, Wah Seong Corp Bhd, Pharmaniaga Bhd, Berjaya Assets Bhd and Tan Chong Motor Holdings Bhd. This year, we only recognised companies with the highest scores in each category. We did not present “silver” awards as there were only three categories where scores between the top two companies were marginal (less than 0.5), unlike what we saw last year. This year, we also updated the awards sectors to be in line with sectoral changes made by Bursa Malaysia on Sept 24. Five new sectors were introduced, three were renamed and four removed. We continue to split companies with big market cap from others in the Financial Services and Property sectors, as we believe those of the same size should be measured against each other rather than against companies with a totally different market cap. Even as more companies get bigger and better, the bar continues to rise with every improved performance. Ultimately, companies that continue leading the pack are those able to sustain outperformance over the long haul.